Scripture teaches us to make the most of our time because the days are evil. One of the ways to make the most of your time is to invest your time in the church. Why the church? Simply this, the church is the body and bride of Christ. I suspect that you are aware of your own body constantly (either by its limitations or its opportunities to survive and flourish). Likewise, if you are married, you are constantly aware of (and hopefully concerned about) your husband or your wife. These concerns for our bodies and for our brides are reflective of the ultimate concern Christ has for His own body and His own bride–the church. Jesus loves the church. Out of this love, Jesus bears an intense burden for His saints who suffer–particularly for His saints who suffer persecution on account of their belonging to Him (see Matthew 5:10-12). Recognizing this degree of love, Project 13:3 is joining together with Christians everywhere to remember the persecuted church on Sunday, November 11, at 6:00p.m. 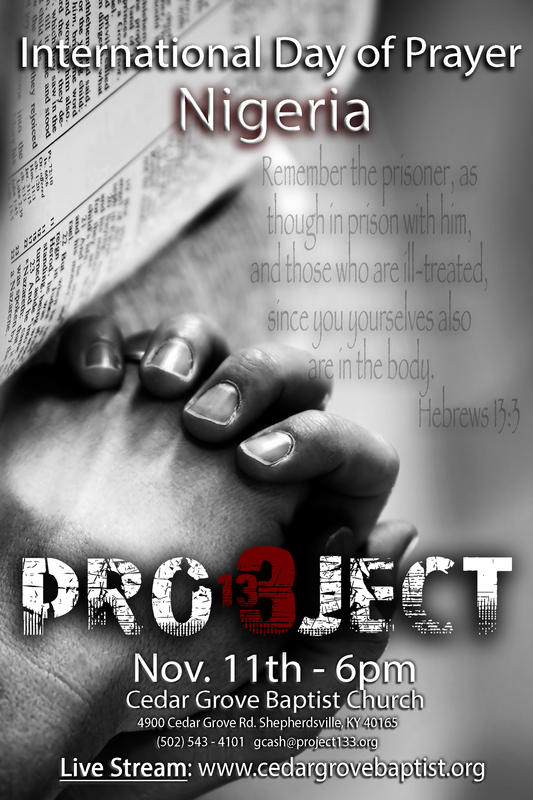 Project 13:3 has put together a program which features Christian persecution in Nigeria. Not only will the program include testimony from Nigerian Christians through video, but it will also include live prayers by Nigerian Christians on behalf of their brothers and sisters being targeted by violence. Christians have suffered persecution every day this year in Nigeria. Violence is a diurnal reality. We can help them with our prayers. If you cannot make the live event, you can still join Project 13:3 via livestream. There is no reason to miss this significant event. This entry was posted in Persecution and tagged Bride of Christ, Cedar Grove Baptist, christ, christian, Christian Persecution, Christianity, IDOP, International day of prayer, Matthew 5:10, nigeria. Bookmark the permalink.